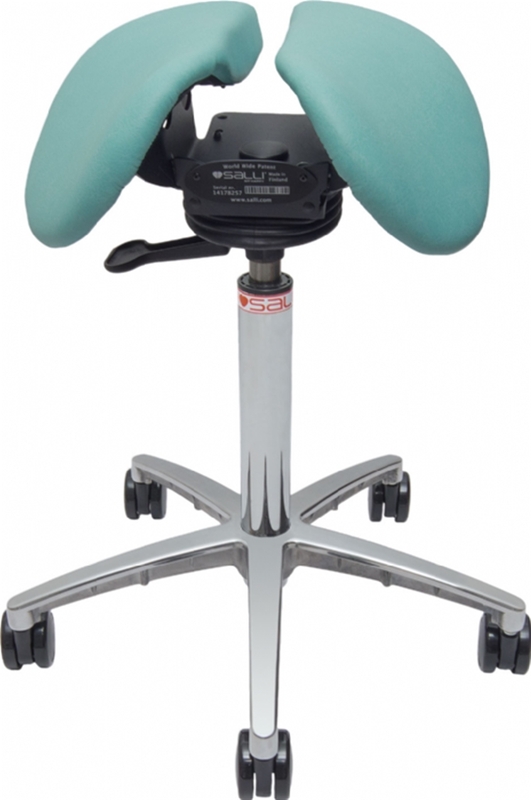 Premium saddle stool for active work. 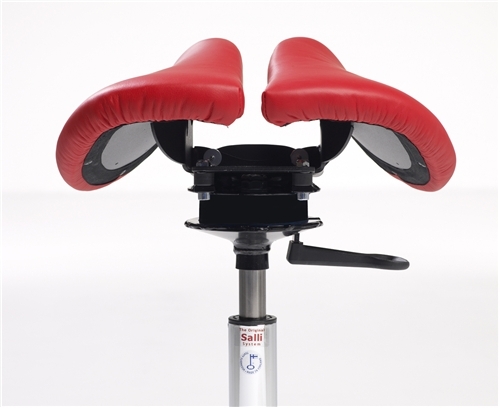 Anatomical split-seat saddle rocks and tilts, following the body's natural movements to reduce postural strain. Seat height options for short, average, and tall users. 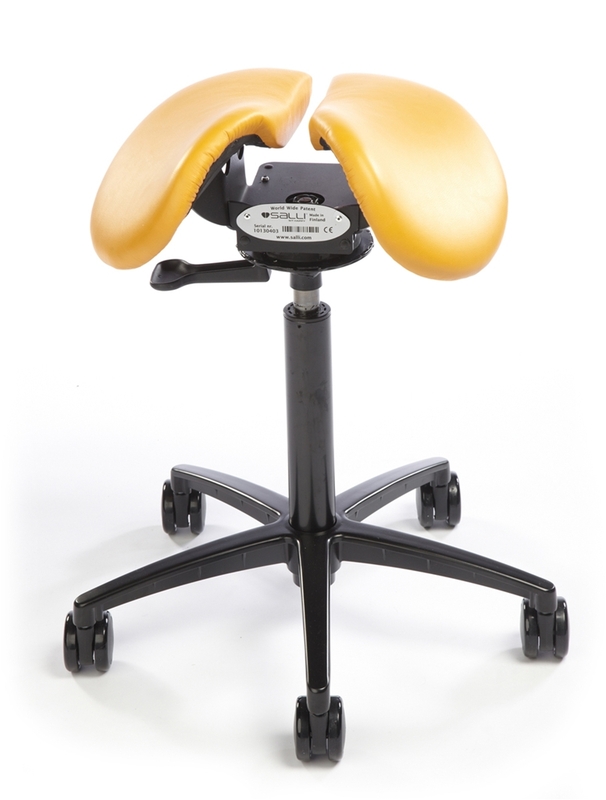 Saddle chairs help maintain the natural shape of the spine during sitting and working. The movable seat on the Salli Swing adjusts to the movements of the body. Even small movements will stimulate muscles in the abdominal and pelvic area, similar to sitting on a gym ball. Rocking seat mechanism tilts in every direction without a separate adjustment lever. Professional quality CA TB117 and CA TB133 upholstery options for demanding commercial and clinical applications. Made in Finland and USA. 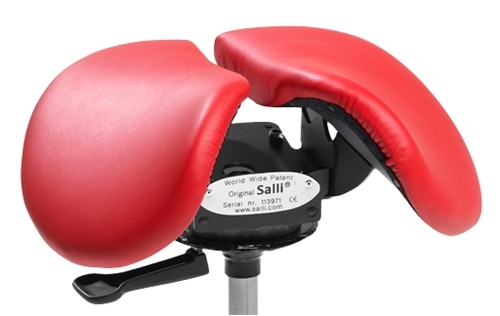 Salli Saddle chair professional upholstery fabrics are commercial quality and certified to meet California's stringent flammability requirements. Not all colors are available for all products. Fabric and color availability may vary in different countries and from various dealers. For our current color availability, please view the color choices offered in the "Buy" menu for each individual product. Colors and textures on your computer monitor may vary from the actual material, and dye lots may vary. We encourage you to request a free swatch to confirm your color selection. Samples can be sent to USA destinations only. Please note, fabric swatches may not be available for products upholstered outside the USA. Top-quality, full top grain, aniline dyed Scandinavian bovine leathers. Exceeds California TB 133 flammability standards. Luxurious semi-aniline leather combines comfort and durability. Soft and breathable natural leather is more durable than any synthetic. Meets TB117/TB133 flammability standards. Luxurious 100% polyurethane synthetic leather upholstery with the natural grain appearance of leather. Durable and easy care. Abrasion resistance exceeds 400,000 double rubs. Luxurious synthetic suede is soft and durable. 88% polyester, 12% polyurethane. Abrasion resistance 100,000 rubs. In-stock items ship in 2 - 5 business days from our USA fulfillment center. Special Orders are hand-crafted in Finland and ship directly from Finland to your door. Production time in Finland ranges from 2 - 4 weeks. Air freight delivery usually takes an additional week. Customs and import fees are additional.